This feature is currently available with our integration with QuickBooks Online. If you're interested in setting this up with other accounting softwares, please reach out to support@abacus.com! 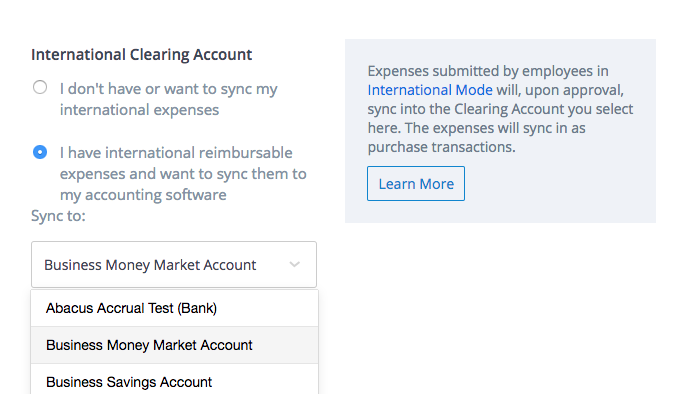 Expenses submitted by employees in International Mode will, upon approval, sync into a specified Clearing Account as individual purchase transactions. Each expense will be dated according to the expense date and be booked to the expense account associated to the category of the expense. All transactions will be synced in USD. As a reminder, no payments will be processed for these expenses! You must reimburse your employees outside of Abacus if they do not have US-based bank accounts. Navigate to your Accounting Sync page in your settings. Scroll down to the International Clearing Account section of the page. Select the second toggle, "I have international reimbursable expenses and want to sync them to my accounting software." Select the bank account where these expenses are getting paid out of (this is where the expenses will be synced to, and they will be booked to the correct expense account). That's it! Moving forward, each International Mode expense will sync into this account as soon as it is approved by a company administrator.